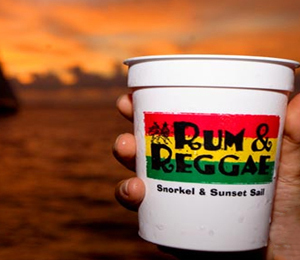 Enjoy the best that Key West has to offer with our Rum and Reggae trip. We've combined two of our most popular tours - a Key West snorkeling adventure and a Key West sunset cruise- into one package, with just one price - the Rum and Reggae! First, cruise out to the coral reef on one of our state of the art catamarans- part of the largest and most comfortable fleet in the Florida Keys. The Rum & Reggae Sunset Snorkel combo package is one of Key West’s most enjoyable late afternoon cruises, combining two of the top Key West activities. On the Rum & Reggae, you will first head out to the famous and beautiful Key West coral reef gardens, where you will get the chance to explore the reef and all that Mother Nature offers in the spectacular marine world. Discover hundreds of species of fish, coral, turtles, and rays as you enjoy the year-round warm, clear waters of the Florida Keys. This is one of the main reasons Key West continues to rank as one of the nation’s top vacation destinations. The tropical weather mixed with the amazing eco-friendly activities such as snorkeling, make Key West the type of vacation destination that never gets old. After about an hour and a half of Key West snorkeling, you will get to relax and unwind by enjoying unlimited soda, beer, water, and our famous rum punch. As we head back to our dock in Key West, guests get the chance to appreciate the most magnificent show in town- the Key West sunset. Our crew will provide all guests who are 21 and up with unlimited rum punch as you listen to the soothing sounds of reggae aboard our luxury catamaran. Watch the red and gold rays of the sun disappear behind the horizon as you finish out an exciting and relaxing half day on the water. This is a truly ideal way to spend a late afternoon in paradise! I have been to the Bahamas many times, but Rum and Reggae - Sunset & Snorkel Combo is one of my favorite trips! It includes everything that everyone should do here. As a Bahamas veteran, I can say only the best about this experience!